Even the best reps know sales is largely a numbers game. The more shots you take, the higher your chances of scoring. That’s why keeping your pipeline full of viable leads is one of the best ways to set your sales team up for success. After all, the more prospects you contact, the greater your chances of closing more sales. So, how can you make sure you always have plenty of high-quality sales opportunities in your pipeline? By stepping up your sales prospecting game – starting with the tips and advice outlined below. Sales prospecting is the process of finding, vetting, and contacting potential customers for the purpose of expanding your business. If all goes well, a portion of your prospects move through your sales funnel and come out the other end paying, loyal customers. Where many sales reps tend to go wrong, however, is spending too much time on unproductive prospecting activities. 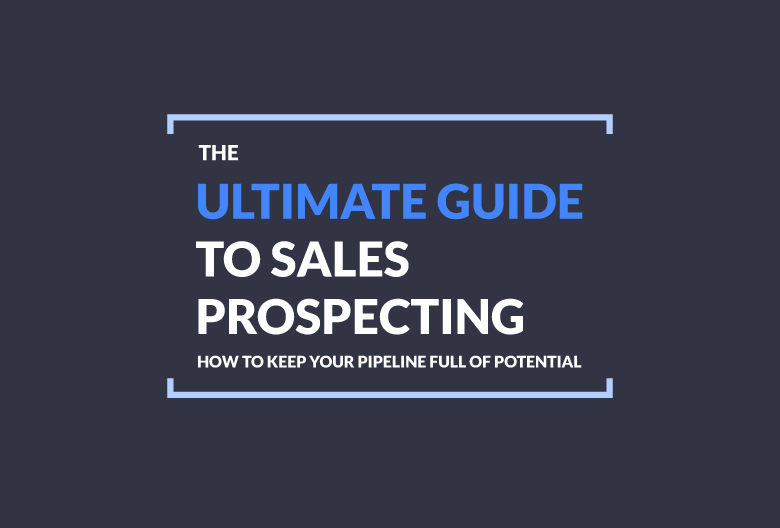 If your approach to prospecting doesn’t keep your pipeline full of new sales opportunities, it’s not going to sustain your business. To help you and your sales team use your time more efficiently, we put together this list of tips for getting the most out of your sales prospecting efforts. Before you can close your next sale, you need someone to sell to. 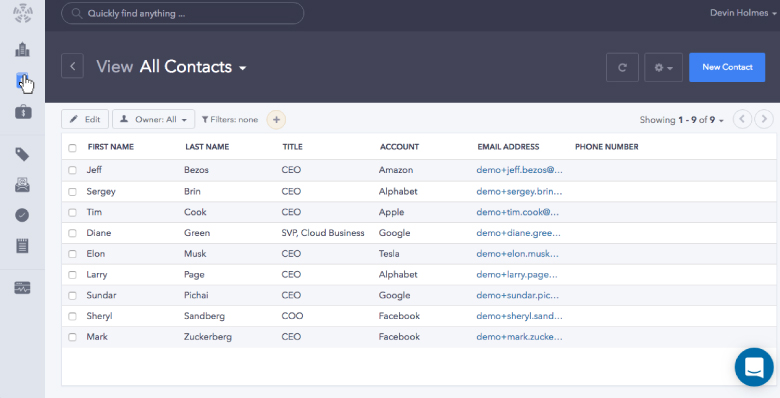 So, the first step of the sales process is creating a list of contacts that you or your team members can reach out to. You should start by conducting the preliminary research you’ll need to put together a list of contacts. This includes each prospect’s full name, email address, phone number, company name, industry, and role. One of keys to a strong list is identifying contacts high up on the food chain. Ideally, you want to connect with decision-makers rather than gatekeepers. Decision-makers wield purchasing power, so those are the relationships you want to focus on building. It won’t matter how convincing your pitch is if you can’t get in touch with your prospects. That’s why it’s so important to verify the accuracy of your list before you begin sending out emails or making calls. Do some digging to make sure the contact information of each prospect accurate and up-to-date. We recommend using a tool like Hunter (it’s free!) to verify your list. Unfortunately, not everyone on your original list has potential to become a paying customer – because, once again, sales is a numbers game. But how do you identify which leads you should focus on? After all, your prospects might be in different industries, at different types of companies, in different roles, facing different pain points, working towards different short- and long-term goals. In order to qualify high-priority leads, you must first define your ideal customer. This involves identifying your top 5-10 existing customers, examining their shared traits and behaviors, and developing a profile that can be used to pinpoint prospects that have potential to become high-value customers. Once you have a clear understanding of who you should sell to and which customers are most worth your while, you can build a qualification framework around that profile. You can either create your own lead scoring model from scratch or modify an existing one (like the popular BANT framework) for convenience. When it comes to sales prospecting, you can never be over prepared. The better you understand what your prospect thinks, feels, and cares about, the better you can tailor your sales pitch to match their needs. So, in addition to qualifying potential prospects, you should also be tracking information about the individual as you discover more about their needs and challenges. You can also use this data to prioritize your list when deciding who to focus your energy on first. A few places to look for insights on your leads include their company blog (if they have one), social media profiles, and the “About Us” section on their website. This information will help you build a more personal connection when the time comes to reach out and connect. Whether you’re sending cold emails, cold calling, or following up on inbound leads, it’s crucial that you find a way to connect with your prospects. The good news is, you’ve already collected enough information that you understand your leads and can create personalized outreach messages. So, let’s put that research to good use! Reach out as a person, not a company: Did you know that 43% of recipients mark email as spam based on the sender name or address? Your sender name should be your actual name (first and last), rather than your company name or sent from a faceless “do not reply” address. Subject lines matter: Not only is your subject line is your very first chance to make an impression on your prospect, but it’s your only chance to stand out in their inbox. Unless your contacts click on your email, you won’t have a chance to build a relationship with them. Get personal: This is where the research you’ve done on individual prospects proves extra valuable. Use what you know about a prospect’s business, needs, and industry to tailor your message. Showing the prospect that you know them – that you really get their challenges and desires – can open them up to hearing about your solution and taking your offer seriously. Provide value first: If you launch into a sales pitch the moment a prospect picks up the phone, they’re unlikely to be interested. You need to hook them with an understanding of the value they can gain from taking your call (or responding to your message). So, before you try to sell your product or service, sell them on the value of spending their time speaking with you. Are you following up enough times to get through to your prospects? If you’re like the majority of sales reps, the answer, unfortunately, is probably not. 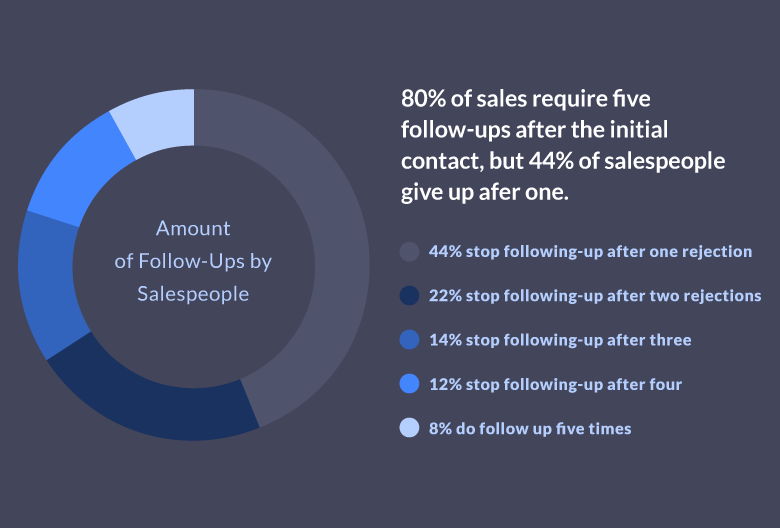 In fact, the average sale requires a minimum of five follow-ups to close – yet only 8% of sales reps follow through to that crucial fifth follow-up! Here’s what you should take away from this: whether it takes you three or five or more touchpoints to turn a prospect into a customer, it’s worth the effort to follow-up on your follow-ups. Finding awesome new leads doesn’t happen by accident, so you should try to make a point to prospect every day. Build it into your routine, schedule regular reminders, and make a habit of following up with leads at every stage of your sales pipeline. If you have trouble remembering to follow-up within a reasonable timeframe, you should take advantage of a CRM like Propeller to keep all of your sales activities on track. In addition to helping you follow up with leads more often, you can use a CRM to track and improve other aspects of your prospecting efforts. The more consistently you record customer data throughout the sales process, the more power you’ll have to iterate and improve on sales activities at every step – from prospecting to pitching to closing. For example, you might want to track opportunities by source – that is, keep tabs on where your best leads are coming from. Once you know exactly where the majority of your high-value opportunities originated, you’ll know where to focus your resources for future prospecting, so you can find similar leads with huge potential. 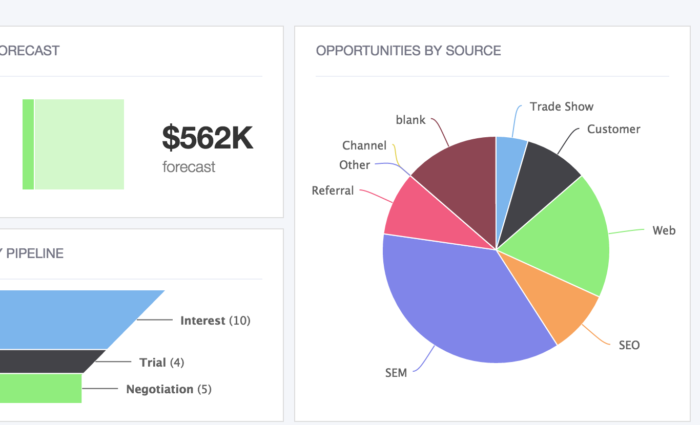 One of the most valuable sales metrics you should track is your opportunity creation rate. 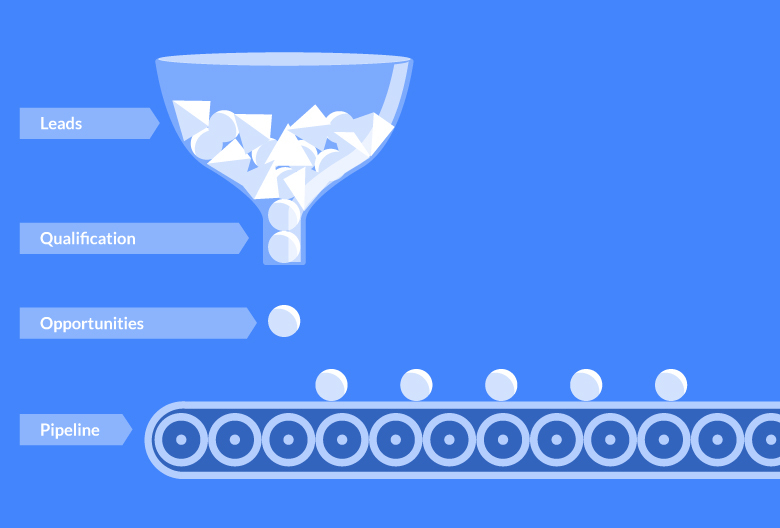 This tells you how quickly leads are entering your pipeline and helps ensure you have enough potential customers in the funnel to maintain a healthy sales pipeline coverage ratio. Did they voice any objections? How can we more clearly address these concerns earlier in the prospecting process? Did we uncover any new hurdles (i.e. lack of budget?) If so, what can we do to qualify future leads for those characteristics? Does our contact have real decision-making power, or do we need to connect with someone else to move this deal forward? What’s the potential value of this opportunity? How can we surface and connect with more high-value prospects? Did we learn anything that should impact how we vet prospects or approach similar deals in the future? By enlisting the help of a CRM like Propeller, you can streamline every aspect of your sales process, including prospecting and lead generation. You’ll spend less time on data entry, uncover insights about your prospects and customers, and never forget to follow-up again.